Here’s the skyscapes news for March. On Tuesday I taught my ‘Painting for Absolute Beginners‘ class at Borrego Art Institute. The gal who does their social media came around and took a bunch of photos on her phone, then obliged by taking some on mine. I don’t often get to be in front of the camera. Answering questions during the paint-mixing exercise. Disclaimer, I am actually wearing shorts behind the pinny. Color mixing exercise gives the students a cheat-sheet to go home with. If you’re in SoCal, I run the class in 3 different venues, plus my studio, or I can come to you in reasonable distance, with a group to teach. Last night I guided a small group through a paint and wine class at Vanguard Gallery in Moreno Valley. 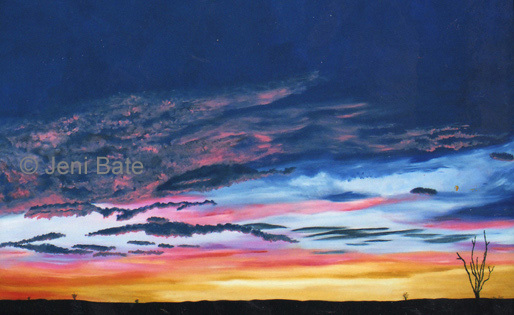 One of my students had already taken classes with me, including the Absolute Beginners class and was happy to work through this painting of winter solstice sunrise across the Salton Sea to hone some of the skills. It’s easier to paint the bottom of the panel when it’s upside down. I only had two students in my Paint the Night class last night at the Vanguard Gallery in Moreno Valley, but they both had fun. One of the questions were, what kinds of birds are they? Jenibirds? Blue fronted swifts? This is a very popular image, and sometimes students use their own imaginations and create red-fronted Jenibirds, or once, blackbirds. A couple days ago one of my Absolute Beginners students came to the studio for some follow-up lessons. She had been practicing in the intervening year and had also bought some books containing lessons. They were fine books and she had learned a lot from them as you can see from the work she produced that she showed me. Some of this students work. Yes, I know it’s a photoshop together, just couldn’t get the right angle for a table-top shot. Nevertheless, if a picture is worth a thousand words, and a youtube video a million, then sometimes a little bit of extra in-person instruction is priceless. Sometimes I’ve shown students the difference between the brushstrokes they’re making and what they need to do to get the effect they’re aiming for by making the two types of brushstroke on their inner arm. Often it’s also picking up on the slight difference between to two in order to guide them. Many years ago I went through a bird-painting phase. A couple of these have made great subjects for my Monday afternoon class. This Monday just past, I guided the group through creating a flamingo that had folded its long neck up so it could hide its beak in its wings. Here’s the group having completed their versions of Folded Flamingo. About 15 months ago, ‘Jo’ took my absolute beginner’s class. Earlier in the month, she took the class again, not having painted very much in between. One of the things that I ask at the beginning of the class is what the student hopes to get out of it. It can help me tailor the class a little to hopefully cover any specific items. In this class Jo was lucky in that she was the only one, so we got to discuss her progress a little more. She had indeed painted the day before, using watercolor crayons. The papers were tiny piece of printer or drawing paper – not the best surface. Jo expressed that she had had difficulty making out what she had painted afterwards and had ended up using ink to define the items painted. Towards the end of the afternoon, after the standard Shadows exercise, we looked at Jo’s paintings and I thought we could tackle one of them as a larger watercolor and make a more realistic painting. Working a little larger does help. This time we used watercolor paper (Canson 140lb cold press) – about 12×9″. I drew a quick value sketch first on a scrap to outline some of the changes that we would make to make the little barrel cacti look more round, and the rocks “rocky”. The main adjustments were addition of shadows/shading to bring out the shapes of the cacti and rocks. I suggested a simple blue sky/purple hills/sandy mid-ground behind the cacti in order to make them stand out from it, rather than a green one of a similar tone. The cacti flowers didn’t come out as well as hoped – I’m not by nature a floral painter and they were a little on the small side to do much more with than a bit of impressionism. Jo said her husband thought everything she painted was wonderful, but when he came to pick her up after the class and we showed him the before and after, there was no faking those eyebrows shooting skyward. Here’s the before (on the right! 🙂 ) and the after. Monday’s cactus painting on the right, and Tuesday’s redo with Absolute Beginners class and a little individual guidance.